* Many fixes to the strtotime() function, over 10 bugs have been resolved. * New OCI8 that fixes large number of bugs backported from head. * A final fix for Apache 2 crash when SSI includes are being used. * A number of crash fixes in extensions and core components. * XMLwriter & Hash extensions were added and enabled by default. Had to go to a business meeting in downtown Toronto this afternoon. So, like most people I drove to the subway with the intent of making the rest of the way via public transit. 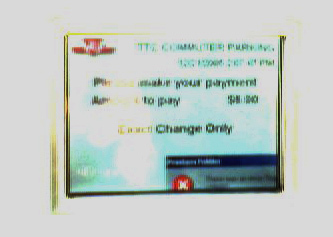 Upon arrival to the TTC (Toronto Transit Commission) subway station I attempted to park my car at the designated parking lot. Alas, this was not to be thanks to Windows "empowered" parking meter guarding the lot entrance. As you can see from this rather poor quality, phone picture it was dealing with an unexpected error. Something to do with USB (???) device not being found, go go windows. This of course ment that no matter what the gate wouldn't open and myself and a dosen of other commuters had to find an alternate parking spot in mid-afternoon in downtown North York. Not a particularly easy task, let me tell you.